The bag in the bow of the boat looked innocent enough. Most angler's bring something along with them on a trip and although I should ask, I usually just trust they wouldn't bring a bag of "stuff" that might hurt the fishing. Sometimes that "stuff" just slips under the radar...and sometimes, even though there might be "stuff" in the bag that might hurt the fishing, it turns out to be OK anyway. This day was another hot August day. Temperatures would be in the mid 90's and the heat index well over 100 degrees. Josh had already been fishing when I pulled into the parking lot and it had been a slow morning. The mission was to convert all that slowness and the sad faces, into a good afternoon of floating and catching for the guy from Mississippi. It took only a short time to knock the skunk off the day and our now happy angler was soon setting the hook with some regularity, as the bag with the"stuff" sat quietly in the front of the boat. Josh had the best place on the river. That place? That place is front casting brace and Josh would make the most of his fortunate circumstances. He stuck the first quality brown trout of the float which would only prepare him for things that might come later in the day. There isn't a lot trout water in Mississippi unless you count the water where sea trout are found off the Mississippi Gulf Coast. So Josh was trying to learn all the techniques he could to be used on future trips to Tennessee trout waters. The water has been clear which makes the need to be stealthy all the more critical. Less false casts, reach casts and slight mends have been the ticket for more and better fish. The temperature continued to climb and clouds, although few, were welcomed. Hydration was key and as it has been all summer, necessary to have the body ready when the opportunity comes. Opportunity came many times on this day and soon it came in a big way. Josh was getting a good presentation right down a line of logs. The bottom dropped from 2' to 4' just along the line of blowdowns. A quick mend and the presentation was dead drifting along with the current. Josh lifted the rod tip and the fish made a big lunge to the top. The rod was bent and bouncing as the fish started head shakes, trying to spit the fly that looked so tasty just a few seconds earlier. Josh was trying to remain calm as the fish took him for the Nantucket Sleighride, Tennessee style. We anchored the boat and with some coaxing the fish finally made its to the waiting net. After what seemed like an eternity to Josh and probably the brown, this fight was over. The fish was released to be caught again and hopefully many times to come. Just like that, after all the instruction and all the learning, Josh is the newest member of the Southeastern Fly 20+ Club. This one has been a long time coming. Donnie has been on the F/V Southeastern Fly several times over the past few years and each time he mentions the 20+ Club and how this might be the day. We were on the river and in the flow before we knew it. The drift boat was floating along and Donnie was producing some excellent presentations. He picked up a nice rainbow in the first several minutes and several other fish. Then we got into a fair number of good brown trout, some of which were very nice fish, but not the exact size we were looking for on this day. His Orvis Clearwater (which used to be mine) was bent more often than I thought it was going to be...and I offered to give him the money back for the rod. He declined. Then Donnie dropped the fly right in the feeding lane. Feeding lanes are important for sure and he was hitting them a high percentage of the day. It wasn't long before Donnie connected with a strong hookset. The fish started to the bottom and began head shakes. When the fish flashed it made the guy on the bench (me) get up and start helping in the fight. As I moved the boat around the river, Donnie kept up the "good fight". It seemed to last well into the evening but in reality it was just a few minutes. At the end of the fight the fish was in the net. Mission accomplished. All fish are measured if the angler is going to enter the 20+ Club and this one made the cut. Donnie did absolutely everything right on this fish. Fly in the feeding lane, check. Proper mend, check. Hookset at exactly the right time, check. Fight the fish and keep the rod tip at the correct angle, yep! So with all that, Donnie, nice work and welcome to the 20+ Club! Oh and I want my darn rod back. 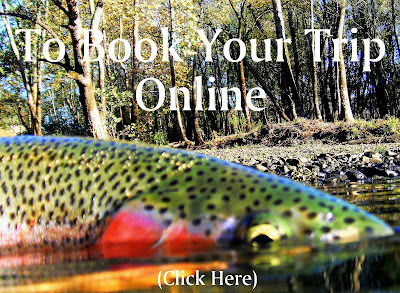 The Elk River- This river is fishing well and especially within the first couple miles. The flows are low & slow. Nymphs and dry-droppers continue to work well on this river. Be patient with the drift and get all you can out of each presentation. The farther down stream you go the more thick the grass becomes. Finding pockets that are void of grass is difficult. The fish are laying along the edge of the grass and they can be somewhat picky to say the least. Each presentation really counts on these flows. The results can be very good though. First fish on the fly can be extremely exciting. Zach (see photo above) worked on his presentation for about 30 minutes and had a couple misses before this healthy rainbow ate. Zach brought it to the net and had his first fish on the fly and another first was made on the F/V Southeastern Fly. It has been a good year and I have been very lucky to help a good number of new anglers get their first fish on the fly. The Caney Fork- this river is getting some heavy use right now. The flows are nice for some good floats. We are boating healthy fish most every day. There have been some quality fish coming to our flies which include some midges, nymphs fished deep and terrestrials. The large sluice is now running when the the USACoE runs a generator. My recommendation is to stay out of the dam pool while the large sluice is running. Over the years I have seen more than one boat get sent to the bottom and some have been torn to pieces. It's not a good place to be while the generator and sluice are running. Also, the small sluice (250 CFS) is running most of the day. 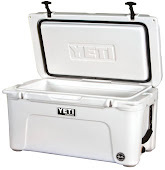 The 250 CFS is another reason the water drops out slow. Wading can be limited for a period of time after the generation is turned off. Be careful because the water release has changed the conditions just a little. TWRA has also been on the river with regularity. It's good to see these folks on the river and they are "catching their share" as well. We have been stopped several times over the past few weeks and we appreciate these folks. So there is the report for the Middle TN area. It doesn't matter if you are a beginning angler like Zach or a seasoned veteran we are working hard to make each angler's experience one to remember. The dates are booking into September and the fishing has been good. If you want to get a day in the casting brace please contact us using the information below. Thanks and see you on the river. 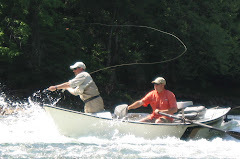 "Project Healing Waters Fly Fishing, Inc.™ is dedicated to the physical and emotional rehabilitation of disabled active military service personnel and disabled veterans through fly fishing and associated activities including education and outings." This weekend was the annual Tennessee Valley Region Project Healing Waters Fly Fishing Outing. I've been lucky to be a part of this event for several years and each year I enjoy the time I spend guiding the veterans who fish out of the F/V Southeastern Fly. They are "my vets" for the day and we have fun. So on the morning of the event I towed the drifter to the campground and asked who would be my anglers for the day? The coordinator pointed me to Clarence and Gary. Each had practiced their casting and turned out to be pretty good for their limited experience. Neither had fished with a fly rod. Clarence and Gary loaded up and we hit the river. This would be a short float as we needed to keep the guys close to the campground. However, that didn't keep us from catching our share of the Caney Fork trout. Clarence was the first to get a solid hit, but the fish spit the fly before the the line came tight. Gary was quick to learn and stuck the fish shortly thereafter. Gary would be the first to catch a fish on this day. This was one for the good guys in the boat. 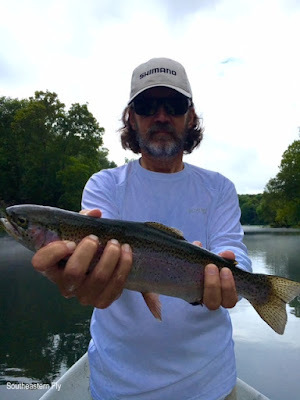 Clarence learned from his first bout with the trout of the Caney and when he got his next chance his line came tight and Clarence boated his trout on a fly rod as well. We spent the next hours hitting all the likely spots. We ended the day in a good run that produced its share of good fish. The finale was all Clarence. Clarence hooked and fought a larger rainbow before the fish let go of the hook and was deemed "the one that got away". We ended the day on that note and headed to the ramp. I could talk for hours about how this event affects the participants and the guides. The written words just don't seem to do the Tennessee Valley Region Project Healing Waters Fly Fishing Outing justice. So let me leave you with this invitation. If you want to help with the event next year please let me know and I will get you in touch with the folks who put it together. If you are on the fence about supporting this event, my suggestion would be to volunteer just one year. Let that experience help you decide if it is worth your time the next year... My bet would be that you would want to come back the following year just like me. Last year Stephanie and Blake took to the braces of the F/V Southeastern Fly and had a nice day on the river. And last year Stephanie was really just getting started and learning. Fast forward to this year she was ready to build on the things she learned last year and of course get some bigger fish on the fly. Blake is a very good angler and extremely competent on the small streams. He was ready for a good day and ready for the chance to spend the day with his wife doing something both love. Eventually we would get Blake into some good water and the fishing skills he has built throughout his years of fly fishing would come in handy. The black lab? Well that was a wading angler's dog. The dog waited stream side while "his angler" searched out fish. As with most labs this one didn't meet a stranger and assumed everyone should be provided the opportunity to give it some petting...and that's just what we did. After we pushed the drifter off the trailer the second time it wasn't long before we had some more action. Indicators and hoppers were each getting their turn to go under the surface. The action wasn't on fire, but the fish they were getting to the net were of some better quality. The coolest take of the day? That has to go to Stephanie. The decision was made to fish the high-value areas. We floated into a normally productive spot and Stephanie dropped her nymph against a log. After a short float she lifted the fly to get past some more structure. As the fly came to the top a fish chased. Stephanie stopped the fly and then continued to raise it to the top. The fish kept coming and just as the fly came up over the log that fish ate. All this was in clear view and we all celebrated a nice take as well as a good fish. Nice work Stephanie. The biggest heartbreak? No not that kind of heartbreak, we are talking about fishing heartbreak. Anyway that one has to go to Blake. As this report stated earlier, Blake is extremely competent small stream angler. So we tried to get Blake into as much structure as possible. The strategy was to get him close and let him place his hopper with a nymph and midge rig in all the likely places, while Stephanie fished along the outside of the structure from the front of the boat. Blake was picking some really nice spots and then a big rainbow ate one of the bottom flies. Blake set the hook then it was a battle. The fish went back to the structure and Blake kept good pressure. I've seen some big fish in the river and this rainbow was as big as I have seen. Blake brought the fish out of the first bit of structure and the fish was coming out toward the boat. Then the line went limp and it was over. The big rainbow ghost back into the structure and we were done. Blake had a good hook set and good pressure, but this one just didn't work out. He handled the lost fish well though and it wasn't long before he was back in the brace and fishing more structure. Then picking up more fish. We continued to build technique into their presentation and had a lot, OK a whole lot, of laughs throughout the day. But the float was coming to an end and the afternoon heat pushed the fish into cooler water. So we all counted this day was a good one. After fishing aboard the F/V Southeastern Fly, Elton decided his son and grandson needed to experience fly fishing in middle Tennessee. So when Jeff and Patrick arrived from Nevada they took a day to relax and then we put them in the casting braces. The fish were in most of the usual places but they were picky at times. We went to hopper/dropper rigs and it wasn't long before we found them looking up. Jeff was dialed-in with the hopper rig. He had some drive-by's, some slaps and some takes. if they decided wrong and didn't take the hopper, the nymph was there several times to take the fish. Jeff and Patrick normally fish the mountains of Nevada and Pyramid Lake, yes that one, they adapted to fishing from the drifter quite nicely. The fish kept responding up until lunch. We stepped out of the drifter and slowed our day down even more. The heat turned up a notch as the oars dipped into the current. With a couple pulls on the oars we were in the current and the guys were fishing catching again. Even though the guys picked up a solid number of fish after lunch, as the thermometer climbed throughout the day, the fish began to seek cover. We went deep to wood and rock structures and that's when the browns came around. Patrick was the star for a while and picking up some good fish. Then he had a good drift just off a rock ledge and the hopper was pulled down by the trailing nymph. The big hopper was pulled to the bottom as the fish grabbed the nymph that was lodged tightly in its upper lip. Patrick did a fine job fighting the fish. The fish came to the net but made one final run and tried it's last trick of the fight. The fish was no match for the 5 wt and the Brodin net that waited. Score another one for the good guys (that's us for anyone who isn't sure who "the good guys" are). It wasn't long before the three of us who were hot and tired came to the end of the float. The ramp was clear and soon we were winching the drifter onto the trailer. The day was a lot of fun. The fishing was good and so was the catching.The guys would hopefully get another day to relax before they boarded the plane and headed back to Nevada.